Halloween marks the time for kids far and wide to collect heaps of delicious treats. At SUNSET® we’re here to help you find healthier ways to indulge your sweet tooth and our WOW™ Berries are the perfect Halloween helper. While we personally believe they’re fresh and tasty enough for Trick or Treaters, here are two delicious SUNSET® WOW™ Berry recipes that will make you the toast of any Halloween bash! Candy corn’s got nothing on our WOW™ Berries Napoleon! Deliciously deceiving, this dish looks you spent hours in the kitchen but only takes a few minutes to prepare. Freshly baked, crunchy phyllo squares combined with smooth, decadent Chantilly cream and freshly sliced WOW™ Berries have made this recipe a fan favorite. Try it for yourself and tell us what you think! Thaw phyllo pastry dough to room temperature overnight in the refrigerator. Preheat your oven to 350 F. In a bowl, combine WOW™ berries, sugar, lemon juice, and vanilla. Gently toss, then cover and refrigerate for 20 minutes. Lay a single sheet of phyllo onto a parchment lined baking tray. Using a pastry brush, gently brush the entire sheet with melted butter. Repeat until three layers are complete. Sprinkle top layer with 3/4’s of the pistachios, then repeat another three layers of phyllo and butter. Sprinkle remaining pistachios on the top layer. Using a pizza cutter, cut the sheet into six equal sized rectangles and bake for 13 minutes or until golden brown. Remove from oven and cool to room temperature on the tray. Add cream and vanilla to a chilled stainless steel bowl and whisk until soft peaks form. Sprinkle sugar over the cream and whip to stiff peaks. 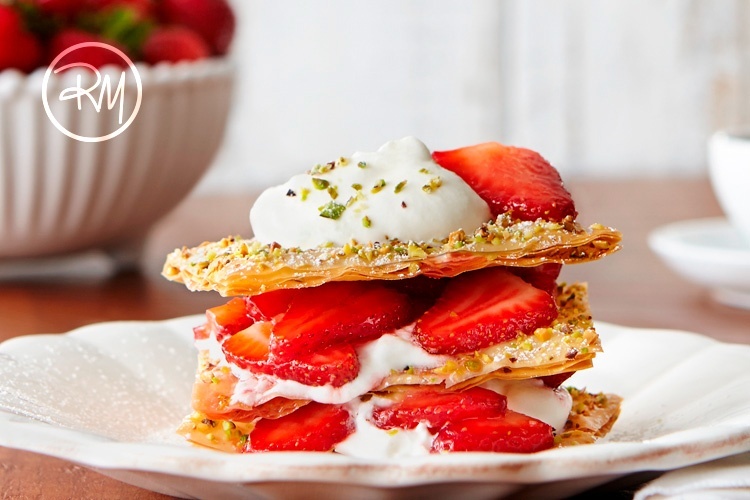 Layer whipped cream, phyllo, and strawberry mixture on a serving plate and finish with a dusting of icing sugar. If our WOW™ Berries Napoleon wasn’t enough for your sweet tooth, check out our Whoopie WOW™ Berry Pie. This “adults only” dish is a chocolate lover’s dream! Brandy soaked WOW™ Berries atop semi-sweet chocolate pie filling and rich cookie crust will have you begging for just one more slice! In a medium bowl, add WOW™ berries, brandy, sugar and vanilla bean scrapings. Refrigerate for a minimum of 1 hour. In a medium bowl, combine cookie crumbs and melted butter. Evenly spread into a greased 9” pie plate. Refrigerate. In a medium pot, heat milk and cream over low heat, making sure not to boil. Remove from heat, add chocolate, and stir until chocolate is completely melted. In a separate bowl, whisk egg yolks very well. Add the chocolate mixture to the yolks a little at a time, mixing completely before adding more. Be careful not to scramble the eggs. In a small bowl, combine water and cornstarch until smooth. Add to the chocolate and bring to a low simmer. Stir and simmer until the mixture reaches the consistency of sour cream. Pour mixture into pie crust and spread evenly. Cover with plastic wrap and place in the refrigerator for at least 2 hours or until set. Top each slice of pie with WOW™ berries and finish with shaved white chocolate. There you have it—two delicious alternatives to candy bars that will make this Halloween season extra thrilling! Stay tuned next week for a more kid-friendly recipe that’s sure to please. Get ready for the Pepper-Pocalypse!